Gayle has been a professional singer for many years, working in various musical styles ranging from Folk to �Show� Bands. A happy accident found Gayle guesting with Essex rock band If's & Butts featuring the petite Marya Lord on bass and outsized extrovert (his description!) Mark �Zippy� Rasmussen on guitar. From this first meeting a germ of an idea began to form, all that was needed was a drummer. Initially, Marya's old school friend Martyn Halls was interested in the project and his groove-centred rock style fitted like a glove. 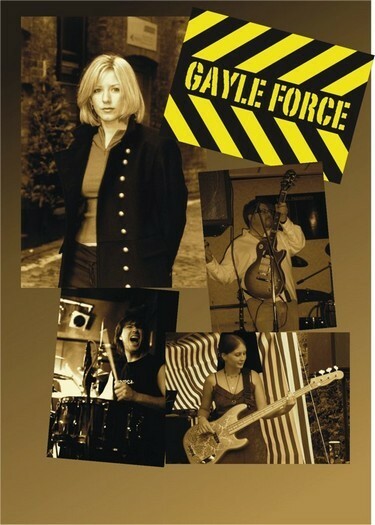 So Gayle Force was born, playing a mix of lively covers with a few original songs seamlessly woven into the set. The stripped-down sound of just drums, guitar, bass and vocals is sometimes reminiscent of roots rock n' roll whilst Mark's blues/rock approach to guitar (think Keith Richards meets Status Quo) lifts the roof on many classic rock numbers. Gayle's soulful voice and the wonderful grooves set up by the band's rhythm section lends a further dimension with soul classics such as Mustang Sally and Hard to Handle combined with ballads such as Under the boardwalk and Never Loved A Man. Finally, Gayle's love of female icons such as Sheryl Crow, Chrissie Hynde and, more recently KT Tunstall takes the band into the realms of �edgy� vocal driven pop and rock.